On March the 12th 2018 it’s five years since I’ve started my dojo Aishinkai Aikido. So much has happened since then. A time to celebrate and of course a time to reflect. The decision to start my own dojo wasn’t an easy one. I was training Aikido since 1996 and little by little I felt a growing wish to have my own dojo, where I could share and further discover my own path in Aikido. But, decisionmaking was not always my strong point. I’m a thinker you know. So, by the time I decided to really go for it, a period of hesitation had passed. Should I really do it? And what would other people think? What would my teachers think? Am I a good enough Aikidoka to share my stuff with others? The possible opinions and reactions of others ruled my thoughts. What t..f… was I thinking, starting my own place! Well, at one point I just decided to go for it and to be okay with whatever reactions I would get. This was what I wanted and the time was right! One of the bigger decisions in my (Aikido)life! I wanted it to be something solid, well prepared and sincere from the start. I had put my heart and soul in this thing. I have had long talks and many moments of reflection on the matter with my teachers, friends and family. And I also attended a nine month teachers course. Not just to get a teachers certificate, but to learn and practise several teaching mechanics and be amongst other Aikidoka with the same ambition to teach. A great time and learning experience this was! Before I had finished the teacherscourse, the unique opportunity came up to rent a dojospace in Mijdrecht. Willem and Marjolein, owners of “WL Combatics”, opened a new gym in Mijdrecht and they had some extra free time in their schedule, which I could fill in. We connected and soon we agreed I could start on Tuesdayevenings, from march the 12th 2013. I’m very happy I did and also very thankfull for their faith in me and their hospitality! I still train with my group in their dojo, until this very day! Now I had to get the news out there that I would start teaching Aikido. Without students no dojo. A friend of mine helped me build a website www.aishinkai-aikido.nl and created flyers, cards, a dojo Facebookpage, you name it. 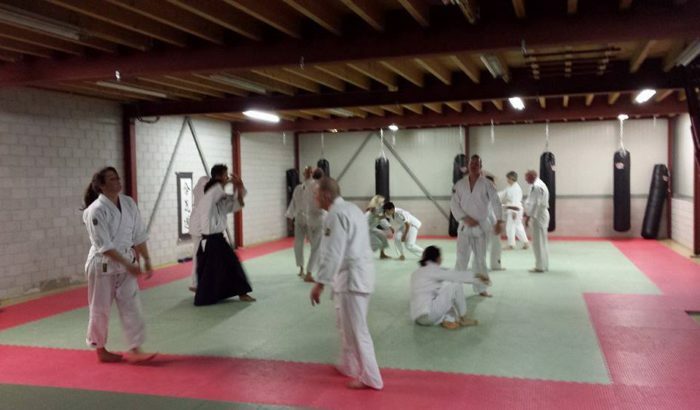 A couple of weeks before the first class, I wrote a small article in a local newspaper, about the new Aikidodojo. Now wait and see if someone would actually show up. And show up they did! This very first class twelve new people stepped on the mat! Man, was I happy with this! But where to begin? What was my plan? First of all I was very proud I overcame my fears and started the dojo. It felt great! My own place to further search for, refine and share my Aikido. But now a new feeling of doubt came up; would the students like my teaching? Did I teach them the correct way? And how about the exams, was I going to fast or to slow? Remember, I was -and am- also still a student myself! The first year or so, I remember I was truly happy every time the students actually came back to the dojo to train again. Over the past five years, many people came and went and slowly a steady core of students kept on training with me. 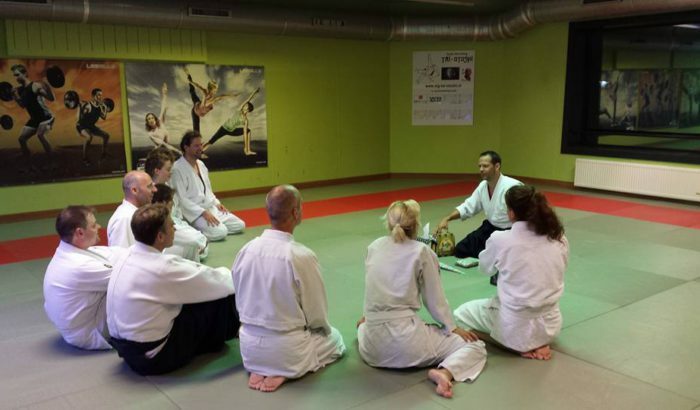 Currently we are with a fine group of some 15 students ranging from absolute beginners to 2nd kyu level. And some fine students they are! Hard working and always curious. Often they present me with challenging questions and some of them are not easy to answer. These questions I take with me when I go to train with my teachers and ask them to help me. And than I take the answers back to my dojo and share them in my class. I think it’s very important for me as a “medium advanced Aikidoka” and as junior teacher to keep training and studying myself. Otherwise the students may pick up on my lack of development or motivation. This is also why I only teach two classed weekly, so I can keep on training myself. My current schedule consists of training and teaching Aikido, and training Brazilian Jiu Jitsu (BJJ). On average I’m on the mats five to six times a week, devided over several dojo’s and not counting the many extra seminars during the yearI attend in both Aikido and BJJ. I put a lot of time and effort in training and I get many good things in return! In martial arts no presents are given. If you want to keep evolving and get the best out of it, make sure you put your best into it! Since a little over two years ago I’ve started training BJJ and I have been combining it with my Aikido practise since then. One moment I’m teaching or training Aikido as an advanced black belt and the next moment I tie on my white belt at BJJ class. A refreshing and humbling feeling! I started from subzero again and this also helps me to never forget how my beginning students feel when they step into my Aikido class. Also, training BJJ helps me to expand my technical budo horizons and I am more clear about what I want in my Aikido practise. It was an exciting and, in the beginning, scary step to start training but now I’m very happy I did! 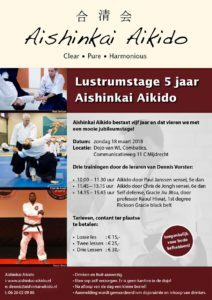 Another thing I started doing since two years is to teach Aikido to a group of special needs children at Sportsclub ONLY FRIENDS in Amsterdam. These kids have all kinds of disabillities, ranging from Autism to Down’s Syndrome. I teach them one hour a week and this is a very special hour. Actually I feel as if they are my teachers too! These kids help me to reflect on my communication skills and mental and physical attitude. How to connect with them and guide them safely thru training and making sure they have an hour of fun is a big challenge. At ONLY FRIENDS we say : “You are just fine the way you are” This is what it’s all about to me; we are all different and just fine the way we are! Years ago it would have been my standard reflex to say NO to difficult challenges or to keep thinking them over. And over. And over. But now I say YES to challenges! Why? Because by now I have a good sense of my strengths and weaknesses and I feel confident with my own ideas and opinions. This is a fine effect of training martial arts; a growing self awareness and confidence! To me, it’s a proven fact that good things will come from saying YES sometimes! These decisions bring you a lot if you give them a chance. I benefit from them on a personal level, but my students benefit too! 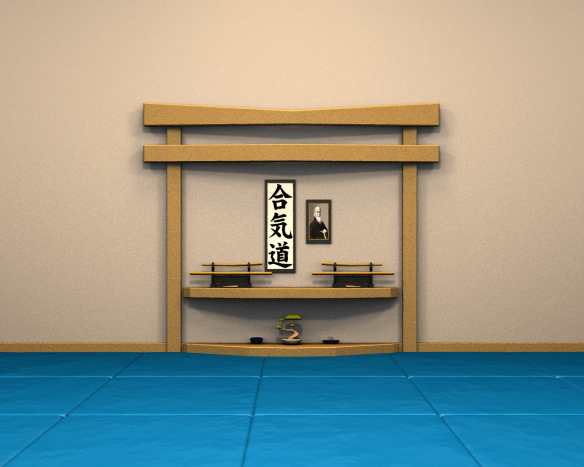 Starting my own dojo was a big decision and full of unknown challenges. But I am very happy and proud I did! I have so many people to thank, because I could never have done all this riding solo. Big thanks, of course, to my teachers, my students and everybody I’ve come across during all those years of training! You know who you are and what you mean to me! Thank you all for your continuous support and motivation! And my biggest thanks goes out to my family! To my wife Danielle and children Sam and Boris! Your unconditional love and support of my busy training schedule means the World to me! DOMO ARIGATO GOZAIMASHITA! Now off to the next five years. My personal goals and wishes are to enjoy life with my family, to stay happy and healthy and get the best out of my training. Always giving it my best, challenging myself and hopefully keep evolving in the process. As for the dojo, I will keep on going like this. I never aimed to have a big dojo or blend in an organisation. I just want my own place where I can study and share my Aikido and be happy. And of course in the process I will keep co-operating with other dojo’s and teachers, for instance in organising seminars. 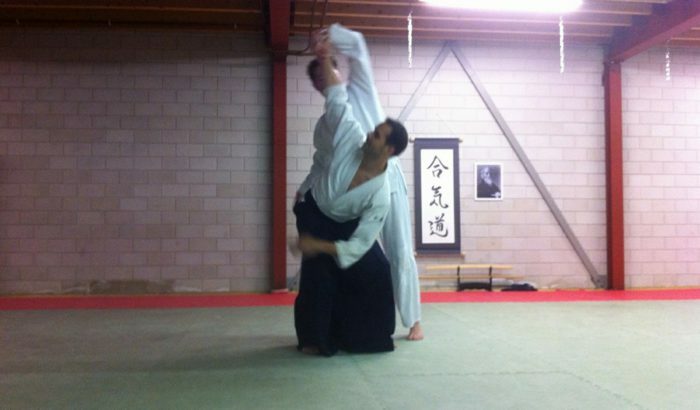 Enjoy Aikido and Budo together! My advice when you practise any martial art: Try to find a rhythm of training that fits in your personal life. Train on a regular basis and make sure you go train! Feel tired? Go train! Don’t want to go? Go train! Do it and trust you will make a step forward every now and then! You will feel good! I promise:) And another thing; ask yourself from time to time if you are still happy with your training. Do you still get fresh energy and inspiration from it? If you feel like making changes: make changes! As far as I can tell, we only live once and you better make sure you make the most of it! It’s always better to look back on mistakes you made when trying something new, than to have regrets for never trying! On march the 18th 2018 we will celebrate five years Aishinkai Aikido, with a day filled with three great trainings. My Aikidoteachers Paul Janssen sensei and Chris de Jongh sensei will each teach an Aikidoclass. And my friend and BJJ teacher, Raoul Hiwat, black belt Gracie Jiu Jitsu, will introduce some self defense principles from the Rickson Gracie Jiu Jitsu system. Don’t miss it! And a couple of weeks later another teacher who is special to me, Léo Tamaki sensei, will visit the dojo on friday april the 13th. 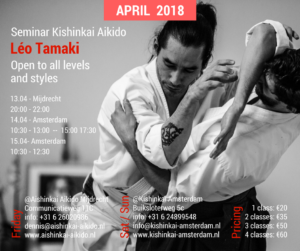 This is the first day of a three day Aikidoseminar with Léo in Mijdrecht and Amsterdam. For both events check the specs on the posters below and keep an eye on our Facebookpage! I look forward to seeing you somewhere on the tatami! Mooie blog van begin tot heden. Fijn om een student van je te mogen zijn en dat je die open blik houdt! Thanks Jean Paul! Fijn om samen te kunnen trainen! Gefeliciteerd met je 5 jaar jubileum! Volgens mij mag je best trots op je club! Ik heb het je vaak gezegd: wat een geweldige goede sfeer bij jullie ! Als collega-beginnende aikidodocente (voor mij nog maar 2 jaar bezig) herken ik al je woorden. Ik had het niet beter kunnen zeggen…..
Ik hoop mee te kunnen vieren op de 18de. Heel veel succes in elk geval de komende periode. Geen twijfel aan dat het weer voor iedereen prettig en leerzaam zal zijn. Dank voor je mooie woorden Brigitte! Hoop je snel weer te zien! Thanks Chun 🙂 CU Soon! Complimenten Dennis. De passie die je voor je werk bij Yacht uitstraalt is van eenzelfde niveau als de passie die je hier in deze blog voor dit nu vijfjarige avontuur uitstraalt. Many years to come. Succes! Van harte gefeliciteerd met je 1e lustrum! Mooi te lezen met wat voor bezieling je werkt. Veel plezier met de komende 5 jaar!